Arguably the coolest novelty feature of the Apple iPhone 5s is TouchID. It's a fingerprint scanner that's placed right below a piece of sapphire glass covering the Home button. When you touch your finger against the Home button the sensor will take multiple 500ppi images of your fingerprint, to be processed by the A7 chip and get your iPhone 5s unlocked. Long story short, it is impressively quick and perfectly accurate. The TouchID sensor offers 360-degree readability translating into effortless scanning of your fingerprint. Apple has integrated TouchID as an added security measure, but it'll still allow you to use your passcode as a backup form of validation. Enabling passcode is also a mandatory requirement in order to use TouchID. Setting it up is as easy as using it on a daily basis. To get started you have to hold your finger on the Home button until you feel a short vibration. Then, continue to touch and lift your finger whilst making small adjustments to the position of your finger each time. The second step is to hold your iPhone 5s as you normally would and touch the Home button again so that the outer edges of your fingerprint get scanned as well. This will make sure your entie fingerprint gets mapped. Apple says that the more you use TouchID the better it'll get. You can commit up to five fingerprint samples (yours or those of family and friends), which is cool for setting a limited list of people with access to your device. Apple warns that with all five fingerprint slots filled in, the TouchID sensor operation may take a slight performance hit, but we didn't notice any such delays. TouchID can be used for more than just unlocking your phone. Apple has integrated the feature into the digital goods purchasing experience. You can use TouchID for making authorizations in the App Store, iTunes Store as well as iBooks Store. You can decide which one of them has access to the TouchID sensor in the Fingerprints settings menu. However, if you've set the Require Password option to Immediately, then TouchID will be disabled for purchases. What bothers us quite a bit is that despite the flawless hardware implementation (the best we have seen so far), Apple hasn't paid enough attention to the software backend of the TouchID feature. It would have made the perfect tool for enabling seamless multi-user access with different security levels or, if that's too much to ask, at least introduce different user preferences for the different fingerprints you have. If you could assign different permissions to individual users, you could for example share you iPhone 5s with your kids safe in the knowledge that they can unlock it, but not max out your credit on apps. A feature that allows multiple user profiles depending on the fingerprint that unlocked the phone also springs to mind and whatnot. Third-party developers are also locked out of TouchID for now so authorization of any purchases outside the Apple stores are a no-go. Here's hoping that Apple's R&D team gets down to work and unlock the great potential that TouchID undoubtedly carries as quickly as possible. Waiting another year for iOS 8 is simply not going to cut it and it might be way too late at that point anyway. 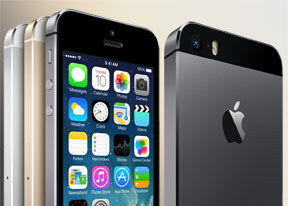 Apple has designed an entirely new chipset to drive the iPhone 5s. It's called the A7 and is the company's first 64-bit mobile system-on-a-chip. According to the gurus at Cupertino, it's twice as fast as the A6 that it replaces in terms of both CPU and GPU power. We'll find out if that's true in just a second. Before that, we should mention that the Apple A7 28-nm chip is comprised of a 1.3GHz dual-core CPU dubbed Cyclone which uses ARM's ARMv8 microarchitecture. The GPU, while not officially confirmed, is believed to be the PowerVR G6430. The use of a 64-bit instruction set for the CPU enables Apple to put more than 4GB of RAM on its future generation of products, but the iPhone 5s packs just 1GB. Not that this feels insufficient - the way iOS handles multi-tasking you are extremely unlikely to run out of operating memory. Moving on to actual benchmarks we start with the new Geekbech 3 test to see how the CPU and memory are doing. The iPhone 5s blasted through the test managing the promised double score over the iPhone 5 and iPhone 5c with A6 chips inside them. As you can see Apple A7 is a good match for the quad-core Snapdragon 800 chipsets, too, placing itself right behind the Sony Xperia Z1. We also ran the iOS version of Linpack. Once again, the iPhone 5s delivers on the promise of twice the performance of the iPhone 5c and iPhone 5. Now, it's time for the multi-platform GFX Benchmark that gives the GPU a run for its money. The iPhone 5s scores a few frames per second less than the Adreno 330 GPU found in the Snapdragon 800 chipset of the Xperia Z1, which is still a great result. In the T-Rex portion of the test the iPhone 5s managed to get even with the current batch of Android flagships. As we saw, the iPhone 5s performs excellently in synthetic benchmark tests. This remarkable performance translates into hiccup-free iOS 7 operation as well. Everything from navigating around the OS to opening apps is instantaneous and without a hint of lag.